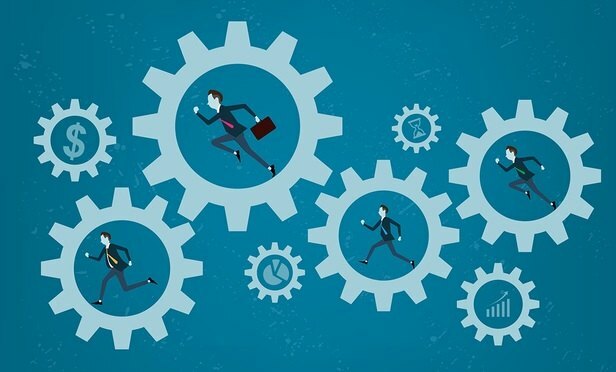 As the UK legal services market consolidates its post-crisis recovery, the competition for talent is intensifying, putting ever more pressure on law firms to attract and retain the best young lawyers. So how successful are law firms at making young lawyers feel valued? 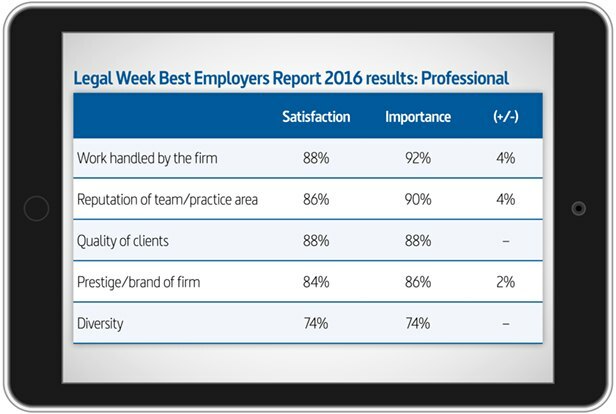 To find out, the Legal Week Intelligence Best Employers Report – now in its 13th year – canvassed the views of more than 2,300 fee earners across a spread of UK, City and international firms. Respondents were asked to rate multiple aspects of their professional working lives, both in importance and satisfaction. And young lawyers make demands. High expectations in many areas proliferate, with several categories scoring very highly for importance, notably: being valued by the firm (94%), prospects for career development (92%), quality of work handled by the firm (92%) and salary (92%). As the highest rated category, being ‘valued’ can sometimes be falsely equated with remuneration; instead, there are other factors at play, not least courtesy, respect and recognition. However, few respondents feel motivated to comment positively, even if most (76%) are satisfied. In contrast, the dissatisfied minority is more vocal, with comments such as “trainees are not valued at all”, “we need less spin, more honesty” and “I want to be treated more like a valued member of staff rather than a small cog in a law machine”. 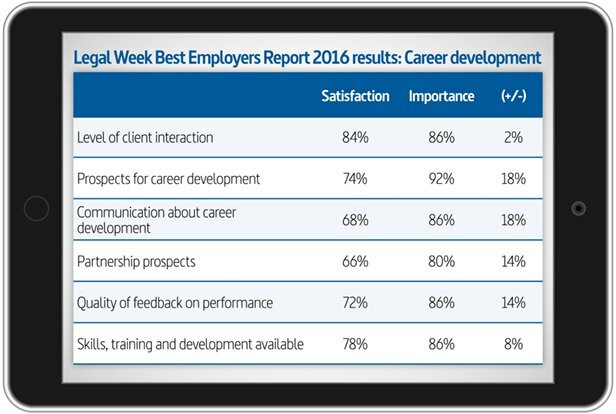 Salary and bonuses still provide the highest disparity between importance and satisfaction of any criteria: 24% and 28% respectively. As the remuneration at some big firms has jumped significantly during the past year, fuelled by a surge in the salaries offered by several leading Wall Street firms, the increasing divide between what the elite international players can offer and the rest has not gone unnoticed by survey respondents. This increased stratification is creating multiple layers in the legal market, with mid-sized firms finding it hard to remain competitive. “We don’t pay top dollar – but nor do we tie you here for every hour under the sun just because we want to see your jacket on the back of the chair,” says Louise Hadland, HR director at Shoosmiths (pictured). But there are some areas of tangible improvement, with the survey revealing that satisfaction with career development and partnership prospects is significantly up on last year – by 15% and 23% respectively. The integration of work and life outside continues to show a divide between importance and satisfaction: 90% vs 74%. But the disparity has reduced by half from a 30% gap last year. Of the different criteria examined by the survey, diversity ranks joint bottom, with only 74% of respondents regarding it as important. Exactly the same percentage are satisfied. With a zero mismatch between the two, diversity might not therefore seem to be a big concern. Every firm interviewed for the survey report speaks eloquently about their strong endeavours to achieve greater female representation at a senior level. But ethnic diversity presents a more complex challenge: one that shows most law firms as laggards rather than leaders. Among survey respondents, Asian (5.5%), black (2%), mixed race (2%) and other (0.5%) give a combined black and minority ethnic (BME) figure of 10%. Set against the 2011 census figure of 14% BME in the total UK population, this may not look too bad. But study the figures for the UK population aged under 35, the graduate statistics produced by UCAS/Sutton Trust and the UK secondary school data from the Department of Education, and the BME figures exceed 30% on every benchmark. Take London in isolation, and all three figures are in excess of 50%. In this context, a figure of only one in 10 BME associates at law firms does not look good at all. One way to address the problem is the use of social mobility initiatives designed to attract a broader intake. Burges Salmon has taken on five legal apprentices as part of the Trailblazers programme, which started in May: “These are school leavers who will be doing their apprenticeship with us, with a view ultimately to qualify as a lawyer with a degree,” says chief people officer Robert Halton. The firm received more than 100 applicants per place. Ashfords is also taking on 10 apprentices this year: “We respond to the fact that not everyone wants to go to university,” says Bryant. To be kept informed of developments for the 2017 report and to find out how you can get involved click here. 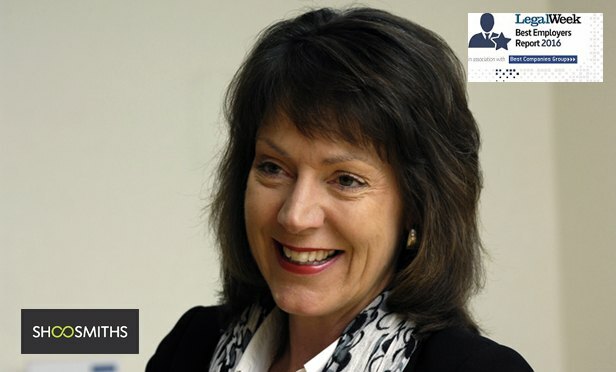 Click here to read profiles of the Best Employers on the BER content hub.